A reader wrote to me with an observation that I found so significant, I wanted to share it with everyone. It’s a story that vividly allows you to see what a difference mulching can make. At a 4 to 6 inch depth her reading was 84 degrees. Outside the bed the temperature was 80 degrees. Remember – this was March 17th on a very warm day in the 70s. As soon as I received her email, I decided to get my soil thermometer and compare because we live close enough that our soil temperatures would be similar under similar conditions. In eight different locations in the heavily mulched vegetable garden at a depth of 6 inches the temperature was 60 degrees. At a depth of 2 inches it was still 60 to 62 degrees. A few of the beds have sides that are not covered by mulch. It was either washed away from the sides of the beds by rain or perhaps blown off by the wind. I just haven’t replaced the mulch. I was anxious to see the difference that would make in the temperature of the soil. Those spots where there was no mulch had washed or blown off — at a depth of 6 inches were 62 degrees. At a depth a 2 inches they were 78 degrees! Imagine the difference in the Heat of Summer! Can you imagine the difference if it’s a 90 to 100 degree day rather than 70 to 75 degrees?! If your soil gets to 100 degrees or more in the summer your vegetables are not going to produce. And if they do produce at all — they won’t give you as much. With heavy mulch (placed there at the proper times to hold mositure) you might find a 20 degree difference in soil temperatures. That would make a tremendous difference in how much fruit your plants can produce. I mulch my garden heavily during the fall and winter months so that I’m ready to go come spring. I still have to add an occasional load of straw in various places, but 90% is done during the fall and winter. 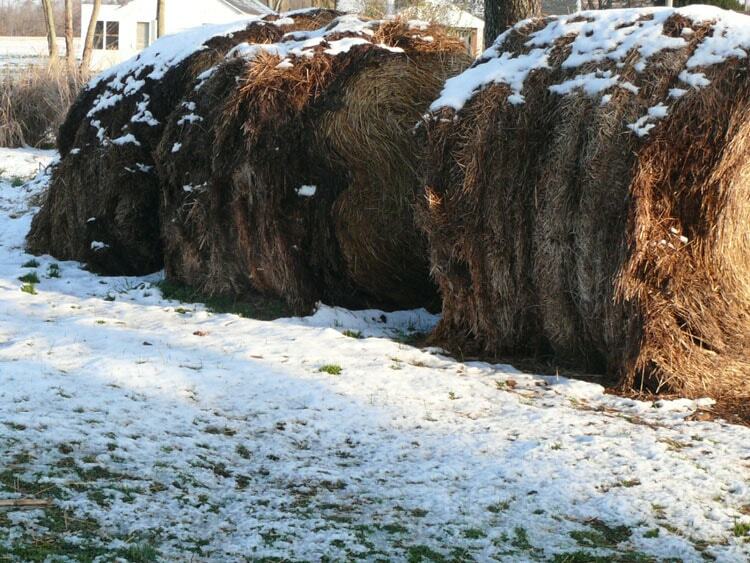 I use from 4 to 6 of these large bales for my garden and borders every year. The best time to mulch heavily is after a rain. If you heavily mulch a hot, dry soil it will keep the heat in the soil. Also the next rain may just wet the mulch rather than soaking through to the soil. So if you find it necessary to mulch a hot, dry bed – do so lightly. Or, if you do mulch heavily, take most of the mulch off when the rain comes and return it to the bed after the rain. The benefits of mulching are many. Keeping the soil cool is one benefit that will help your plants to produce more and give you a much higher yield. A good source for inexpensive soil thermometers. A large percentage of the seedlings had just died here and there. That was across the board – spinach, swiss chard, carrots, beets….I’m pretty sure there was something in that straw that caused the death of many of my seedlings. Additionally, my beds were a MASS of weed seedlings of every type. Not just the thin blades I was expecting, but a variety of different ones coming up by the thousands – literally. I then went to another location and bought some different organic straw to replace. The difference was night and day. No seed heads at all. The straw was even different – a flatter stem and seemed to be quite chopped. The previous stuff was more like a circular stem with many having a seed head. It was sold as straw for mulch, but I’ll never let it through the door again. Again -I’m pretty sure there was something in that straw that caused the death of many of my seedlings. I’m replacing with the organic straw, and I’m sure it’ll be a much better result. Oh, and I checked my soil temps again after reading this post. Same exact readings today. I’m pretty sure it’ll be tough for me to lower the temps of the raised beds as the sun beats on the wooden sides, heating them. Still, the mulch will definitely help. Happy Gardening on this beautiful spring day. Sorry to hear what happened to you Sandra, but glad you were able to get some good straw. Another reader had a lot of trouble with bad straw sometime back. It had been sprayed and messed up her plants like yours. Regarding your soil temperatures: You WILL be able to get the temperatures way down — BUT you have to mulch in the fall and winter and go into the spring with heavily mulched beds. Your soil temperature WILL go down. Maybe not as much as mine — since I have larger area under mulch than you do. But even with your small raised beds, you will be able to get the temperature down. So take heart! Thank you so much for your encouragement, Theresa! This new straw is a whole different beast. Interesting to hear that someone else had the same things (dying plants, millions of weed seeds germinating) that I encountered. I had read that it is best not to keep mulch on the garden outside of the growing season to prevent pests from congregating. And also to not mulch until the weather warms so that the soil is warmer when planting. Can you comment on this? Also, with 6 inches of mulch on your garden, how do you plant seeds? do you just move away enough of the mulch to plant? also, off topic, do you incorporate used coffee grounds into your garden or compost? What are you views on UCG and how do you use them? Indeed you can read just about any view on the internet. And — as you know — there are always advantages and disadvantages to everything. My garden is healthy and I have been mulching for 34 years and I’ve never had pests “congregate”. Although I too have garden pests in varying degrees from year to year — I would say I have no more than those gardeners who don’t mulch. When I pull back the straw to plant an area — say lettuce seedlings — I sprinkle the straw lightly on them when I’ve finished. That will keep the soil from drying but the seedlings can still get sun through the cross hatching of straw. After seeding crops like peas I put a heavier layer of straw on top — maybe and inch or two and the after they come up — I add more straw. When its time for warm weather crops like tomatoes and peppers, I pull back the straw from a spot and plant. And by the way, by the time I plant tomatoes — that 6 inches of straw has decayed to about 1 or 2 inches and I have to add more after I plant. The mulch keeping the soil cooler has never been a problem in my 34 years of gardening. If I could get used coffee grounds I would certainly incorporate them into my soil. Compost is always wonderful. To get more of my views on compost you might want to read my post. Does UCG stand for UnderCoverGardens? Let me know what it stands for so I can answer. Jules, would you please let me know how you found my site. Also- please tell me what area (state) you’re in. Thanks so much. Glad to have you as a reader, and am glad you are enjoying TMG. UCG is used coffee grounds. My local coffee shop allows me to keep a bucket there and they fill it up for me. I am located in Northern Virginia. I just have a small townhouse garden and grow lettuce, beans, tomatoes, peppers and herbs. I had never planted flowers much in the past, but have been adding them recently more for the beneficial insects and birds they attract. The soil is all clay and I have been improving it for the last 15 years with compost. I avoided raised gardens so that I wouldn’t need to water as much. I found your site through a member posting on the GardenWeb forums. You are fortunate to be able to get the used coffee grounds. It’s a great find. Once clay soil has been improved, I think it is actually much more wonderful than improved sandy soil. At our previous place we had clay soil that I improved. It was dense — but it was great! Where we are now I have sandy soil that I’ve improved over 14 years. It’s good — but I think the improved clay was better. Your comment “I avoided raised gardens so that I wouldn’t need to water as much.” confirmed something that I have long suspected: and that is the term “raised beds” means different things to different folks. For example: I’m not set up to water —other than an occasional sprinkling can full carried to a select area — and haven’t been for my 34 years of gardening. I consider my beds to be all raised beds. As soon as I can get to it, I’ll do a post giving details and clarification. Hope my answers to your previous post were helpful. I have a lot of leaves from the garden almost all year round. Instead of mulching with straw I would like to be able to use what I have readily available. Would leaves ( I don’t have any means to shred them) suffice ? Can I just add them directly on the top. Currently I only add compost that I make but its not enough. Aparna — leaves in my opinion are just about the most wonderful thing you can give your garden! They are great for mulching and for improving the soil. By the way — what did you mean when you said you “have a lot of leaves FROM the garden”. I’m not sure I understand what you mean. One thing you might want to be on the look out for is big clumps of leaves that mat together and prevent rain from getting into your beds. Other than that — it’s all good even if you can’t shred them. Most years its all we can do to get them raked up and just don’t have time to go to the extra work of shredding — or in our case — cutting up with the lawn mower. I have used leaves in my garden (in addition to straw) for almost 35 years. Leaving them on top of your beds is fine. My first step is to get them into the garden. After that I distribute to the beds Sometimes I leave some of those big compacted clumps in the paths rather than break them up. I know what you mean about compost. No one ever gets enough. Theresa, I have a few trees that seem to shed leaves different times of the year. I’m not sure if I have answered your question. Good to know that I can put them to better use. Appreciate the tip on watching out on the clumping. I do see that happen in the compost pile as well. Aparna, when you said leaves FROM the garden I was wondering if you had trees right in your garden. Now I think I understand that you mean in your yard. Did you ever do a similar test with soil temp over the winter? I’d be curious to see what warming effect mulch may have. Thanks! I think I’ll make a note to test various bed this winter Anna. Those under covers and those without. Will be interesting.